We ran a sweepstakes to find out which Milgard Series window or patio door you could fall in love with. The sweepstakes is now closed. End date September 28, 2017. One entry per person. See official rules. Entrants must live in one of the following US States: Alaska, Arizona, California, Colorado, Hawaii, Idaho, Montana, New Mexico, Nevada, Oregon, Texas, Utah or Washington. Montecito windows are amazing maintenance-free i love it. I got two patio doors easy to open, well insulated and sound proof. I like its warranty. Moving glass doors are Awesome! #FallInLoveWithWindows I love the Ultra series because of it's sleek design and that they are built to last. Isn't that what a good window should do? 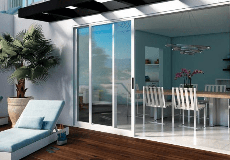 I love the french style and modern style of sliding doors and switching or swinging doors forms. Falling is love all over again and again. #FallinLoveWithWindows My fav is the Style Line Series. Love love love the clean lines and no grids. We have built our mountain dream home in the last year & used high end Milgard windows and doors. Luv them! Now we are starting the guest house & we are doing the same. Milgard all the way!